Radio Controlled UFO – I want to believe! | OhGizmo! Radio Controlled UFO – I want to believe! Do you want to create mass hysteria and be on the front page of the news?? 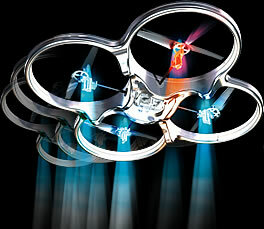 Get yourself one of these remote controlled UFO’s and buzz the night-time sky! Before you know it there will be reports of mysterious objects in the sky and no one will be the wiser. This hovering miracle is jam-packed with the latest miniature technology that fuses four powerful electric motors, two pairs of contra-rotating propellers and an innovative electronic gyroscope to give you one incredible stable flying machine. It’s constructed from tough carbon fibre and impact resistant EPP foam to protect your UFO even if you manage to crash due to some UFO based tomfoolery. Can be flown indoors if, well, if you have a house like one of those on MTV Cribbs. For those of us that live in the real world we’ll be outside with this beauty on a calm day. There’s even one red and three blue flashing LEDS that not only tell you when the gyro is up to speed for takeoff, they also let you scare your neighbours witless with lights in the night sky! Come inside for a few more features. Cost around $150.00 and you can get them here. Problem is: they don’t work very well. Amazon.de just dropped them from their shop because they got most of them back and user forums for the UFO are full of complaints. They obviously tried too hard to make the thing low-price, since the idea is just great.